As I wrote in my first impressions article following Apple's Brooklyn event, I was concerned that putting the iPad Pro in the new folio case was going to be a more involved process than attaching one of its sides to the Smart Keyboard. That first impression was wrong and the byproduct of my limited hands-on time with the accessory. Thanks to its 102 built-in magnets, the Smart Keyboard Folio easily aligns with the flush back of the iPad Pro with little guidance required on your end. With the Smart Keyboard Folio completely open on a desk, I haven't had any trouble placing the iPad on top of it and folding it in typing mode. In fact, I've noticed that Apple intelligently placed magnets both inside the iPad and the folio case so that if you try to place the device upside down on top of the case, it won't attach. 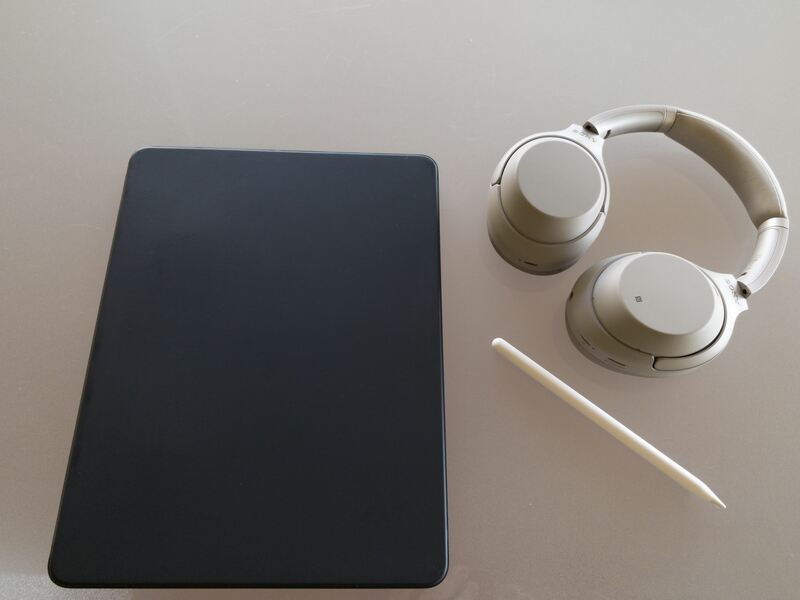 The new iPad Pro may be marketed as an orientation-agnostic computer as far as holding it in your hands goes, but with the Smart Connector and the Pencil's magnetic connector being on one side only, the device only supports one orientation for the Smart Keyboard Folio. Considering what this accessory is designed for, this makes perfect sense. If I had to point out a minor issue with the magnetic connection between the folio and the iPad Pro, I'd say that detaching the keyboard from the iPad now requires paying more attention and a stronger pull. To detach the iPad from the folio case, you have to hold the keyboard down with one hand then pull the iPad somewhat strongly out of one of the two grooves above the numeric keyboard row. Then you have to detach it from the folio case as well. Again, I wouldn't have expected otherwise, but this interaction is worth keeping in mind when comparing the Smart Keyboard Folio to the old Smart Keyboard. To design a folio case that contained a keyboard and was still thin enough to carry around for everyday use, Apple had to rely on a robust magnetic connection between the iPad and the case, and it's only natural that more magnets mean more strength required to detach them. The upside – which is why I believe Apple's magnets layout was ultimately the right decision – is that it's nearly impossible for this case to be accidentally pulled from the iPad Pro. The other new feature of the Smart Keyboard Folio is its support for two distinct typing modes which, according to Apple, have been optimized to be "easily adjustable for lap or desk use". Unlike the Smart Keyboard, the Smart Keyboard Folio comes with two long cuts above the keyboard where the iPad can attach magnetically in landscape mode, changing the screen's viewing angle. From a technical perspective, this is a clever engineering feat that adds options to the classic Smart Keyboard design without increasing its bulk, creating complexity, or forcing you to attach additional clips to the iPad's screen. In practice however, I think calling one of the two angles "desk mode" is a mistake. I find the Smart Keyboard Folio's desk position (the second groove from the bottom) to put the iPad's screen at a steep angle that is uncomfortable to work with when sitting at a desk. I don't know how Apple's Smart Keyboard Folio designers like to sit when they're typing in front of a computer, but I'm 6ft tall and I find that the keyboard's desk mode doesn't prevent neck strain (I'm still staring down at a screen sitting far lower than my line of sight) while being too steep compared to how I'd use a MacBook on a desk. I would have been okay with Apple calling this a "media mode" for watching video while laying down with an iPad Pro in front of you, but I suppose they'd prefer to gloss over the perception of iPads being consumption devices only (though, I must say, watching YouTube and Netflix on this device is pretty sweet). As a result, I've been using my Smart Keyboard Folio in "lap mode" all the time, and with better results. 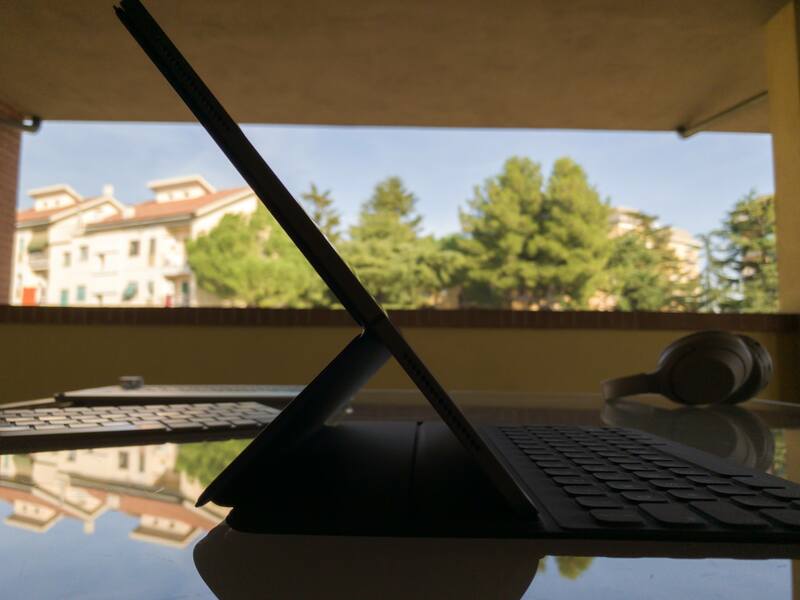 The viewing angle for this mode is comparable to the angle of the original Smart Keyboard for the 12.9" iPad Pro. When I do take advantage of laptop mode with the iPad sitting in my lap, I think Apple was able to improve on the Smart Keyboard1, but we're still far from the comfort of a MacBook or solutions such as Brydge and Logitech keyboards. Laptop mode is my default typing mode when I'm working on the iPad Pro. The sturdier design and improved weight distribution of the Smart Keyboard Folio make it wobble less than a Smart Keyboard when typing with an iPad Pro in your lap, but it still rocks back and forth a little. I don't know what else Apple can do to fix this: this configuration is top-heavy by design, so Apple would have to add extra weight to the keyboard to better balance it in laptop mode, but that would defeat the purpose of designing a keyboard cover that is thin and light. The Smart Keyboard always walked a fine line between portability and typing efficiency, and this has never been more apparent than it is with the new Smart Keyboard Folio. While I find desk mode to be a marketing misstep (or just a weird idea of how people are supposed to sit at desks), I believe Apple managed to balance the compromises involved with laptop use and the keyboard's compact form factor well. If I want, I can write blog posts with the Smart Keyboard Folio on my lap, which I did for several sections of this article. 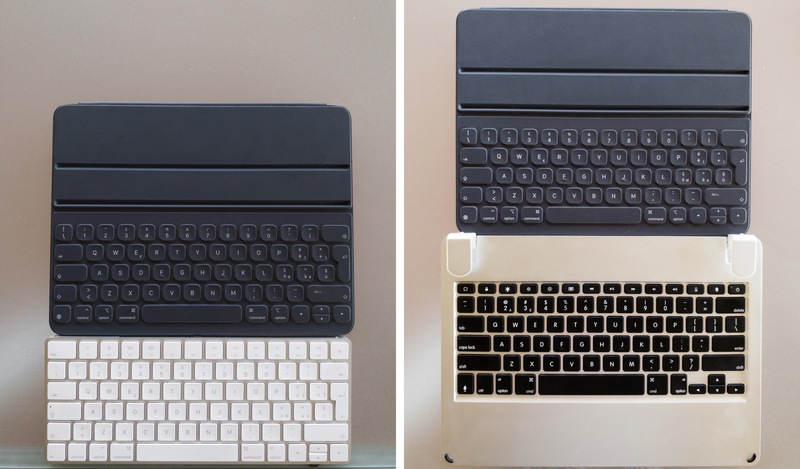 The Smart Keyboard Folio (right) compared to the Smart Keyboard for the 12.9" and 10.5" iPad Pros. Which brings me to my feelings about the keyboard itself. The Smart Keyboard Folio doesn't address my gripes with the Smart Keyboard, namely the fact that it isn't backlit, doesn't offer any special iOS function keys, and is too small for my hands. While I understand why Apple needs to make the keyboard as compact as possible2, the Smart Keyboard has always been too cramped for my hands and typing style. My problem is twofold: the keys are too small and the keyboard's vertical area is too short. Comparing the Smart Keyboard to Apple's Magic Keyboard and a Brydge keyboard should give you an idea of what I mean. As a result of its smaller size compared to other keyboards, I have to be extra careful when typing on the Smart Keyboard and I keep accidentally hitting the globe key in the lower left corner with the palm of my left hand, which triggers the modal keyboard switcher in the middle of the screen. These issues are exacerbated by the fact that the keys themselves don't have a lot of travel compared to other keyboards I'm used to, which slows down my typing. For what it's worth, I do like the sound that the Smart Keyboard makes when I'm typing and when my fingers are gliding across its fabric material (which seems unchanged from the previous generation). Besides lack of backlight, the Smart Keyboard doesn't offer any sort of media or system control functions: it doesn't come with media playback controls; it doesn't have integrated shortcuts for the "go back home" feature, search, or multitasking; it doesn't provide you with a dedicated Siri key that could invoke the Siri assistant. The latter would be useful when combined with Type to Siri on iPad; instead, if you want to work with Siri while typing on a Smart Keyboard, you'll either have to summon "Hey Siri" or reach the top button on the new iPad Pro, which I find to be awkward and disjointed from the rest of the experience. The lack of these options on the Smart Keyboard sum up my troubled relationship with Apple's only offering for iPad Pro customers. Other Bluetooth keyboards, including Apple's Magic Keyboard, let you save time when working on an iPad Pro by embedding core system functionalities into the keyboard itself. 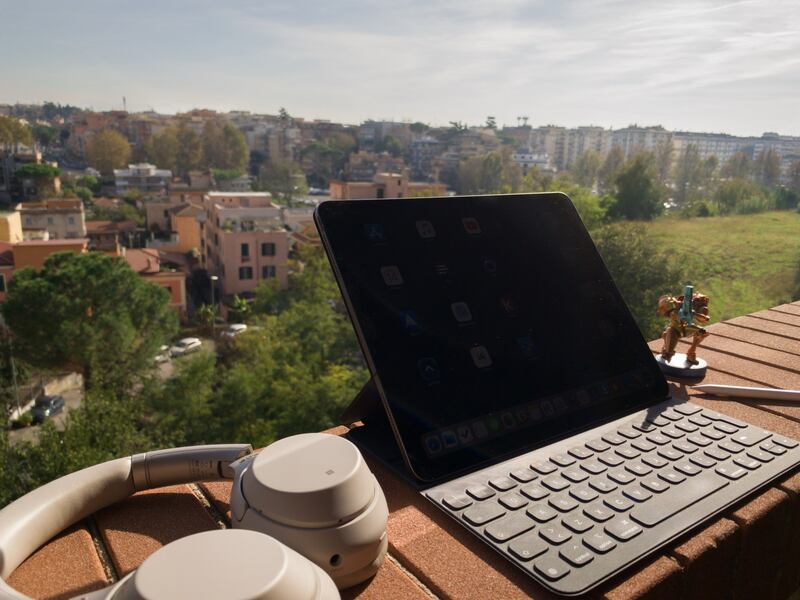 The Smart Keyboard forces you to extend your arm toward the screen to interact with features such as multitasking, Control Center, and Siri, which is not what I'd expect from a $199 (€219 in Italy – $246) keyboard designed by the same company that makes the iPad Pro. The "smart" part of the Smart Keyboard is still true to its name thanks to the elegant foldable design and instant pairing; however, as someone who types for a living and likes to work on an iPad Pro connected to a keyboard, I'm disappointed by the lack of professional features in Apple's Smart Keyboard, three years after its debut. The Smart Keyboard Folio doesn't come with microfiber lining on the inside as it doesn't fold with two layers like the original Smart Keyboard. This design avoids the "bump" that the Smart Keyboard had when it was closed on top of the iPad, thus resulting in a flat and elegant design of the folio, but it also means that the iPad's screen will sit directly against keys and the two grooves when closed. I haven't noticed any issues with the screen getting dirty due to the lack of microfiber protection, but I'm curious if this direct placement will have any effect on key deterioration over a long period of time. We'll see. The iPad Pro with the Pencil and Smart Keyboard Folio fits in the old Apple leather sleeve for the 12.9" iPad Pro, but it's a loose fit due to the smaller footprint of the 2018 model. I wouldn't recommend reusing the old leather sleeve for this new iPad Pro. The Smart Keyboard Folio doesn't offer a "media mode" to hold the iPad upright without the keyboard laid out in front of it. You can fold the entire keyboard behind the iPad if you want to use the software keyboard, but you'll feel the keys in the back while holding the device. Even though key presses won't register because the bottom side of the iPad isn't magnetically attached to one of the folio's grooves, it's strange to hold an iPad and feel the keyboard in its back. As MacStories readers know, I spend quite a bit of time every week working from my car while I wait for my girlfriend to finish teaching her dance class. Unfortunately, I'm finding the laptop viewing angle and compact keyboard to not be ideal for typing in the driver's seat. Perhaps I should consider switching to the more comfortable passenger seat until a new Brydge keyboard with an adjustable hinge comes out. The folio's flat design is functional, but boring. This thing is prime sticker material, and is going to be covered with them soon. Keyboard recommendations are inherently subjective: iPad users have different needs, different priorities, and different budgets. If you value good portability, not having to worry about charging a keyboard, and, with this new iPad Pro, protection for the front and back of the iPad, the Smart Keyboard Folio is probably what you want to get, even though it's not cheap. If you liked the Smart Keyboard before, you're going to appreciate the versatility Apple added in this iteration. Personally, I'd like Apple to provide its pro iPad customers with more options. I would happily trade some of the Smart Keyboard's portability for a larger, heavier keyboard with adjustable angles and extra functions that are natively integrated with iOS and apps. 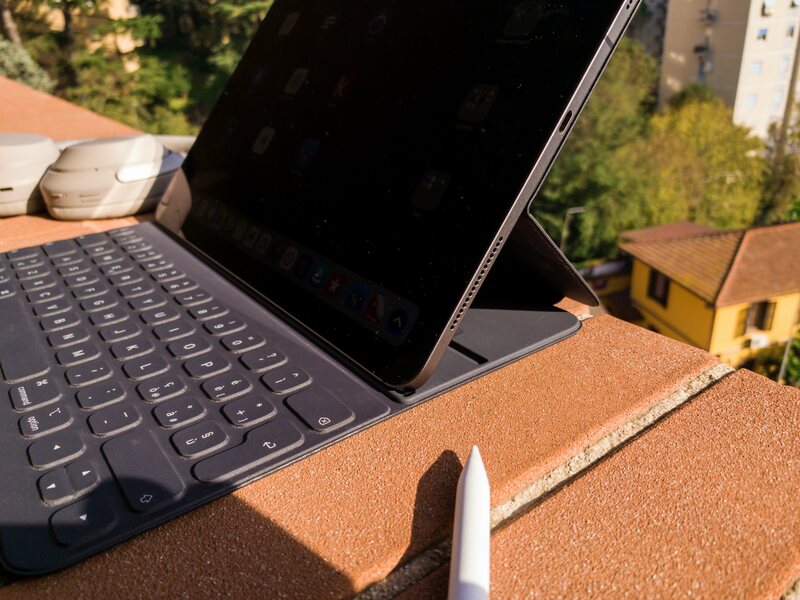 Maybe one day Apple will offer a Smart Keyboard Pro to cater to iPad Pro users like me; until that happens, I'm going to keep an eye out for promising alternatives based on Bluetooth and the new Smart Connector.